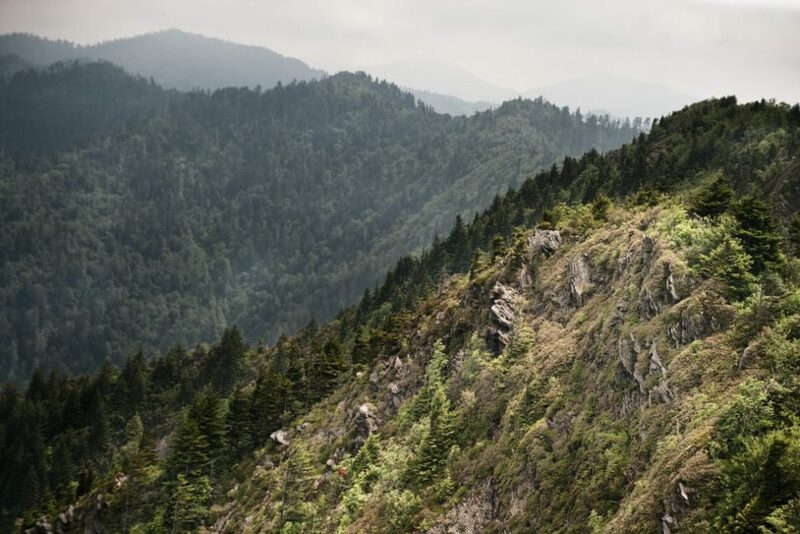 Delving into the etymology of Charlie’s Bunion reveals a historical tale of exploration during the earliest days of the Great Smoky Mountains National Park. Famed author and adventurer, Horace Kephart, was leading a reconnaissance trip high into the remote Saw-tooth region of the Smokies. This knife-edged ridgeline runs between the Mt. LeConte and Mt. Guyot massifs; its airy undulations are some of the most remote parts of the Park and a profile view, of the 10 mile stretch of peaks, resembles the serrated edges of a saw. Worn out from the rigors of exploration Kephart’s companion, Charlie Conner removed his boots during a break and revealed a set of haggard feet. His extremities resembled the nearby, and bulging outcropping of rocks known then as Fodderstack. Kephart, one of the Great Smokies’ greatest advocates, proposed renaming the rock Charlie’s Bunion to commemorate his misery. Charlie’s Bunion, known to locals as The Bunion, can be reached by a 4-mile hike on the Appalachian Trail. A picturesque drive to Newfound Gap, a sight of the Park’s inauguration, leads to the start of this scenic hike. Forests of fragrant Firs line the rocky path and long range views will entertain your eyes as you make your way North on the AT. This particular section of the AT has a total elevation gain of 1,600’ and climbs to over 6,000’ on the sides of Mt. Kephart as it leads to The Bunion. Nearly 3 miles into the trail hikers are offered a reprieve from the rigors of trail life at the Icewater Springs Shelter. Bring a water filtration system and nourishment for a high country hiatus at this “life-list” shelter. Icewater Springs is home to amazing Appalachian views and a perpetually cold water source, making it an ideal resting point on your way to The Bunion. Four miles into your hike a signed spur trail on your left will lead you in the direction of Charlie’s Bunion. Explore the area carefully, large drop-offs and loose rock here will require your utmost attention. Your reward for reaching the Bunion is paid off in views. The Bunion is walled in by the beautiful behemoths: Mt. Kephart Mt. Guyot and Mt. Leconte. An uninterrupted westward view, over the sprawling green expanse of Eastern Tenessee, opens up on the summit. If you’re looking to experience the Appalachian Trail – sans blisters, and without having to walk all the way to Maine – then you will love this 8 mile, out-and-back sampling of the world famous trail. Adventurous scramblers will find a playground on The Bunion’s rocks and photographers can capture amazing sunset views from this precipitous peak. From Asheville, an hour and a half drive will take you to the Newfound Gap parking lot where you will begin your hike northbound on the AT. Ample parking and restroom facilities are also available at Newfound Gap. A day hike to the Bunion does not require any permits or fees. If you wish to stay at the Icewater Springs shelter make reservations in advance, this shelter is quite popular, and plan on purchasing a permit for $4 per night, per person.